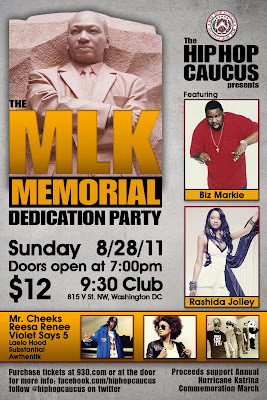 The Hip Hop Caucus is holding a MLK Memorial Dedication Party at the 9:30 Club (7-11 pm) in Washington DC after the memorial dedication on the National Mall in Washington, DC. The dedication on August 28th is also the 48th anniversary of the March on Washington. The multi-talented musician and celebrity personality Biz Markie is the DJ for the night. 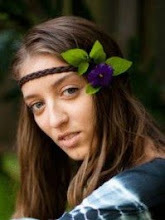 There will also be performances from the beautiful talents of singer/songwriter and harpist Rashida Jolley, who has spent the last year on an international tour performing alongside megastar Lady Gaga, Grammy Winning rapper Mr. Cheeks, Neo Soul/R&B Artist Reesa Renee, Funk/Rock/Hip Hop band Violet Says 5, and can’t miss Hip Hop performances from Laelo Hood, Substantial and Awthentik, plus other surprise special guest appearances via our celebrity red carpet. Also, the day prior, on Saturday, August 27th from 12 Noon till Dusk the National Action Network is holding a rally for Jobs and Justice in celebration of MLK’s legacy. The Hip Hop Caucus is supporting this march. There will be more than 40 Bus Departures scheduled across the country. Click HERE to find details on how to get to DC via the National Action Network’s bus service.